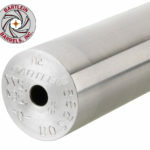 Currently Bullet Central sells 4 different brands; Bartlein Barrels, Krieger Barrels, J. Lederer Barrels, & Shilen Barrels. In this article we will help you determine the difference between them. our machines are so accurate, we can carry the twist rate to the 4th decimal point (example: 11.3642). Their process is done using the Single Point Cut Rifling method, which is the most stress free way to rifle a barrel. This ensures that the twist is exact and that the bore and groover dimensions are uniform. Bartlein Barrels also pre-laps their barrels before any rifling is done, and then finish up the lap after rifling. Krieger Barrels have been around since 1982, and believe that the most important part of the barrel is the steel it’s made out of. Because of this they only accept the best steel they can get, no matter the cost. So they run tests to determine if their steel is good or bad before using it for a barrel. This is also the reason they do not offer multiple grades of steel in their barrels, all of their barrels must meet the same standards from start to finish. They also use the single point cut rifling method and the same lapping method as Bartlein. 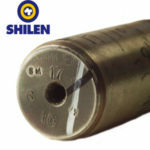 Shilen Rifles, Inc was founded in 1955, their barrels come in two different grades; Select Match Grade and Match Grade. The Select Match grade must air gauge within .0003″ of their standard diameter and the uniformity of the bore cannot vary more than .0001″. While the Match grade must measure within .0005″ of their standard diameter and no more than .0003 variation in the groove. J. Lederer makes benchrest quality barrels that are single point cut-rifled and hand lapped. 1 Featherweight **(.308 or smaller)** 1.220 .700 .550 2.5 6 20 22 2 lbs 10oz. 2 Lightweight (.338 and smaller) 1.220 .765 .575 2.5 6 24 26 3 lbs 3oz. 3 Sporter (.358 and smaller) 1.220 .815 .625 2.5 6 24 26 3 lbs 7oz. 4 Magnum Sporter (.375 and smaller) 1.220 .860 .650 3.0 6 26 28 3 lbs 14oz. 5 Lightweight Varmint 1.220 .910 .700 3.0 6 26 28 4 lbs 8oz. 5-1/2 Medium Weight Varmint 1.220 .960 .750 3.0 6 26 28 4 lbs 14oz. 7 Standard Varmint  1.220 — .890 4.0 — 26 28 7 lbs 1oz. 7 HV Heavy Varmint  1.220 — .940 5.0 — 26 28 7 lbs 8oz. 8 Heavy Bull Barrel 1.220 — 1.000 3.0 — 26 28 7 lbs 12oz. 9 Rimfire Target  1.125 — .825 4.0 — 26 28 5 lbs 12oz. 46 Mag Suppressed Our #4 contour with a swell back up to .880 from the 16.5″to 19″. 19″ 3lbs 3oz. Krieger ranked in the top 2% for brands.